Say hello to your new favorite 30-minute-meal! This easy one-pot dish is great for nights when you forget about dinner until everyone is starving. The meatballs make it nice and hearty. Use store bought meatballs to speed things up even more! Today after Charlotte’s dance class, a little girl walked up to me, her wide eyes on my 8-month-pregnant belly. She said wisely, “I see you have an EGG in there!” Ha! Well something like that, kid. Later I was in the grocery store getting stuff to make dinner, when it was already past dinnertime. My kids were definitely letting me know that I had made a bad parenting choice: maniacal laughing, “fall-down hugs,” running up and down the aisles, randomly grabbing merchandise. Crazy hyper children is always preferable to the alternative (crazy tantrum children), but still enough to drive any mom insane. Especially one who waddles as much as I do. We were in the meat department and I was walking fast while they lagged, hoping that passers-by wouldn’t know the screaming-laughing kids were with me. A lady with an indulgent smile said to me as I passed, “They just have the BEST laughs!” And I said, “You know what you’re right, but right now I still want to strangle them. You basically just saved both of their lives, congratulations.” Thank you, indulgent smile lady. My children owe you one. Who’s ready for some meatballs?? 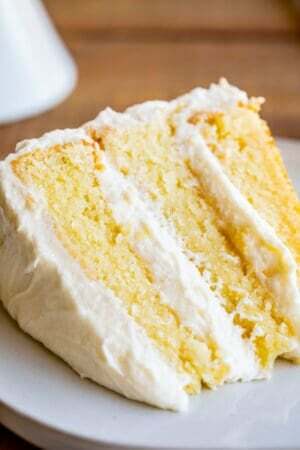 This recipe is adapted from a recipe in my friend Mary’s cookbook. 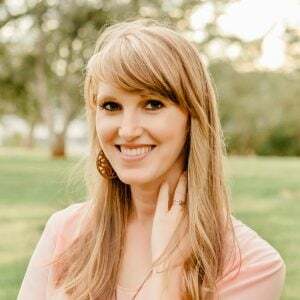 Mary has a fabulous blog over at Barefeet in the Kitchen, and she just released her first cookbook The Weeknight Dinner Cookbook. 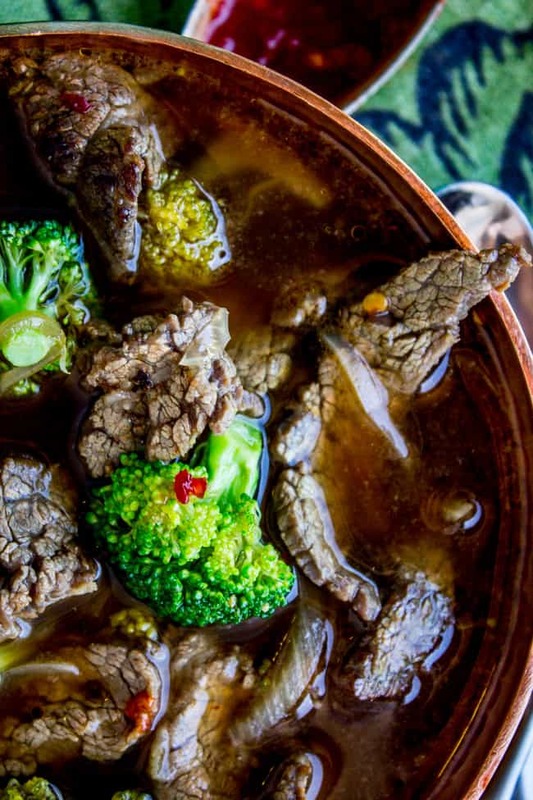 I did a review for the book here, and shared her recipe for Chinese Beef and Broccoli Soup, which was absolutely fabulous I must say. She has a recipe for Kielbasa with rice and peas. It looks really delicious, but I haven’t tried it as written yet. The only prepped meat I had in the freezer on the night I needed to make a quick dinner was meatballs, so I changed up the recipe to work with meatballs. It worked out great! Someday I will try the kielbasa version. Maybe. These are good meatballs. I made this twice, once with frozen Costco meatballs, and once with my Homemade Easy Baked Meatballs. I liked it both ways but of course fresh homemade meatballs are always going to be better than the frozen ones. But sometimes you just have to git er done, and frozen store bought meatballs totally got it done. My kids loved this. Are your kids as obsessed with rice as mine are? This meal is basically perfect for them. Thaw the meatballs if they are frozen. I just stuck them in the microwave for a couple minutes. They don't have to be completely thaw, just enough that they will finish thawing and warm up while cooking the rice. Heat a high-sided skillet over medium-high heat. Add the oil. When the oil shimmers, add the garlic and saute 1 minute, until fragrant. 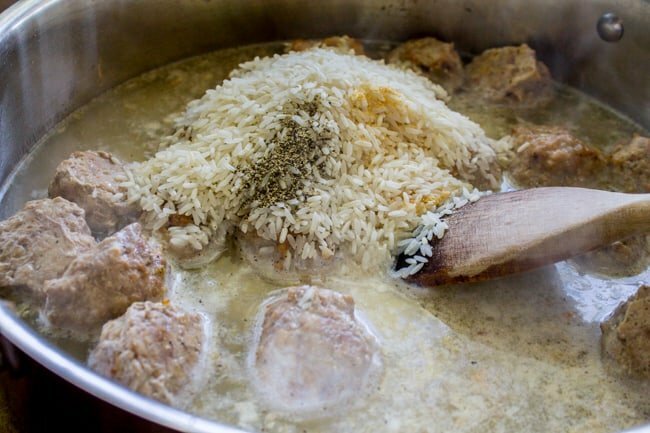 Add the meatballs and cook for 2-3 minutes. Add the beef broth, rice, garlic powder, pepper and salt. Scrape up any browned bits. Stir and bring the heat up to high so that it comes to a boil. Reduce the heat to low to maintain a simmer. Cover with a lid. Continue to simmer with the lid on for 15-20 minutes, until the rice is tender and the liquid is absorbed. Stir at 15 minutes to make sure it isn't sticking. When the rice is cooked, remove from the heat and season to taste, adding more salt and pepper if you want. Stir in the peas. Add as much as looks good to you. Add the green onions and parsley, if using. Cover until the peas are warm, just a few minutes. This is great with a big green salad. I actually ate mine right on top of a bed of spinach. If you wanted you could stir fresh spinach into the meal and let it wilt while it's still on the stove. *As always, I used water and 3 teaspoons Better Than Bouillon. Chinese Beef and Broccoli Soup << this is the soup I mentioned above that is also from Mary’s Weeknight Dinner Cookbook. It’s so flavorful! 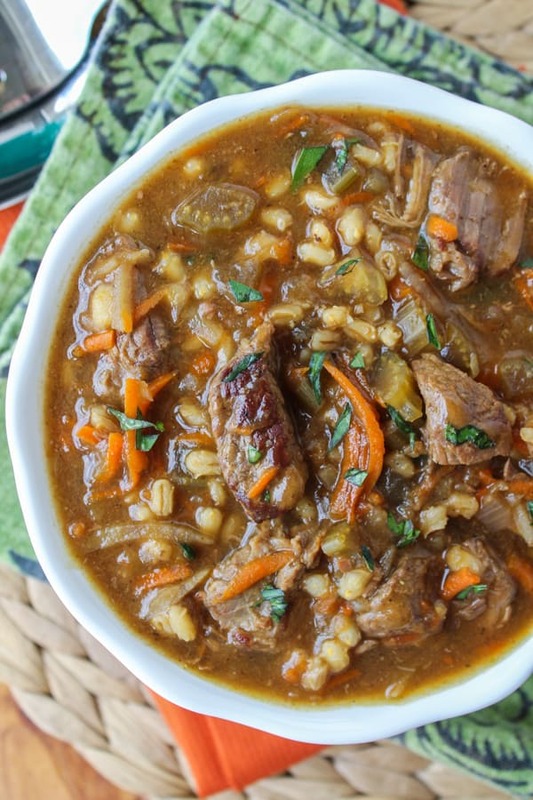 Beef Barley Soup << by far one of the most popular recipes on my site! 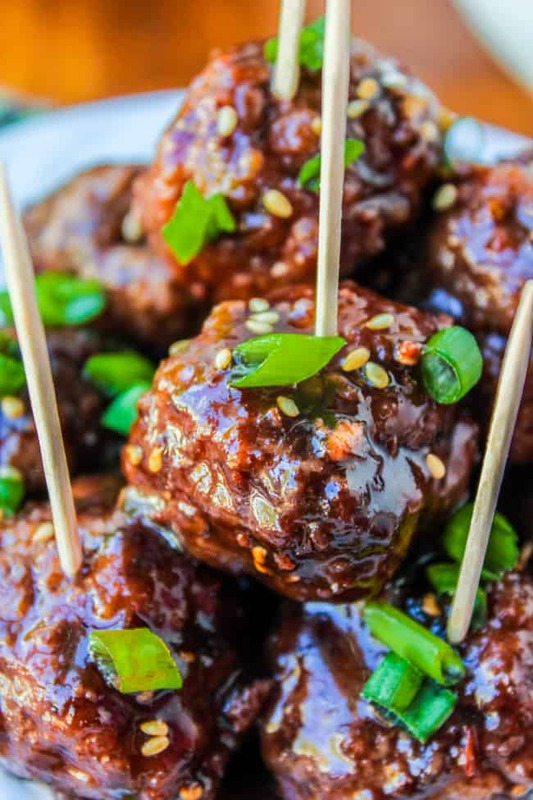 Raspberry Balsamic Meatballs << I just made these again last week! Easy SLOW COOKER meal! The Beef Meatball and Rice dish is the bomb dot com!!! I accidentally picked up frozen Turkey meatballs instead of Beef meatballs, but I didn’t want to go back to the store and exchange it. I had to add an extra cup and a half of water since the rice was a bit on the crunchy side, and to my portion of the dish, I added some Sriacha for a little kick. My sister would like to make this dish for her lunch. I will be making this again, but I will make my own meatballs from scratch. Thank you so much for sharing your recipe Miss Lady!! Could I use ground beef and chicken broth if I don’t have beef broth? Ground beef instead of meatballs? Sure but it will be a little more tough. 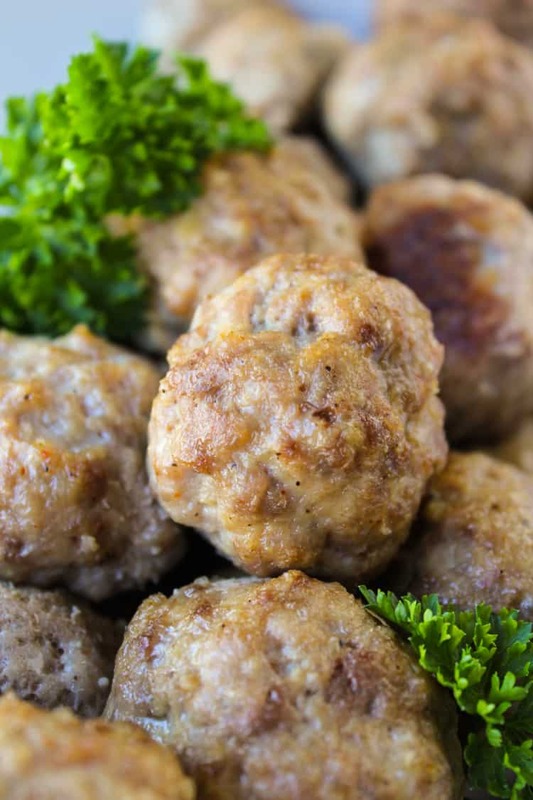 My meatball recipe calls for pork because pork has more fat, making the meatballs tender. Chicken broth will be fine, it won’t be quite as “beefy” but i think it will still be okay. I was out of beef broth so I had to run to the store. I decided to try the Better Than Bouillon on your recommend and wow, it is so much more flavorful than beef broth! This recipe is delicious and will be added to my rotation of meals. Thank you! It’s kind of life changing, right?? Love that stuff. So glad you enjoyed the recipe! Thanks for coming back to comment! 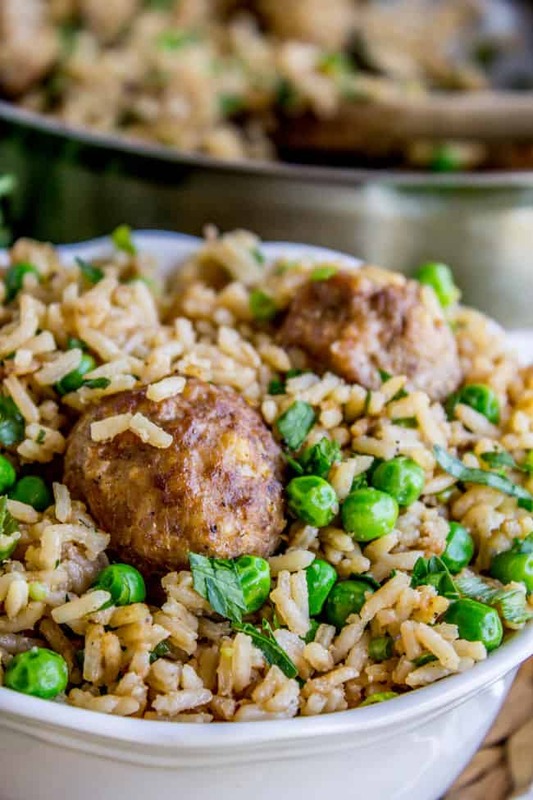 Can you use Minute rice for this great recipe? Hi Cindy! I’m sure you could, but you would have to drastically change the cooking times. Let me know how it goes if you try it out! My family loves this dish. I add soy sauce to the the servings. Ooh great idea for a flavor boost Stacy!! Im looking for a healthier alternative to rice. How do you think this would taste if I substituted plain or black quinoa for the rice? Hey Rhonda! I haven’t tried it but I’m sure it would be great! Any grain served this way would be tasty. Let me know how it goes! Not a review but a question please. 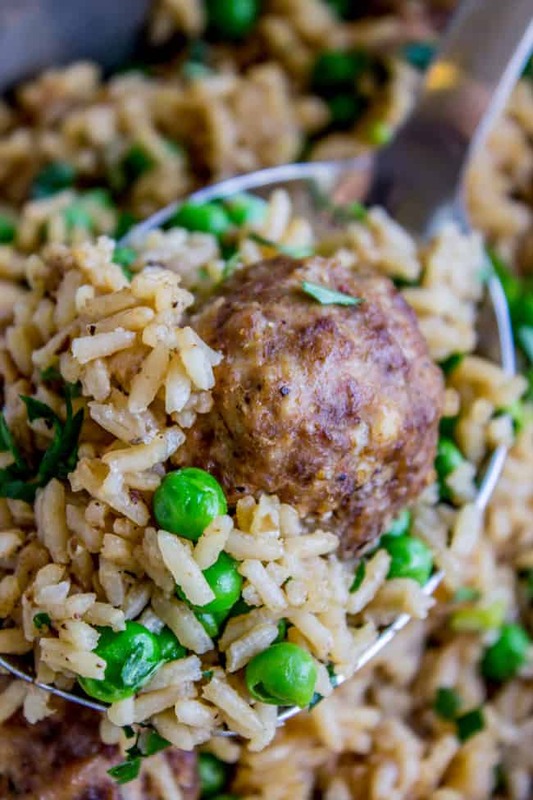 I want to try the meatball, peas and rice recipe but want to be sure about the meatballs. Are they to be fully cooked before adding to the rice and peas or will they cook enough while simmering? It was not quite clear to me. Thank you. Hi Louise! The meatballs should be fully cooked. Buy store bought meatballs or make this recipe for homemade meatballs. Thank You so much for your recipes and I made the Chocolate Chocolate Chip Cookies this morning & I’m telling you that After I had them thawed util they were soft enough To Scoop Into A Cookie Scoop. My Husband and I Loved them. Hi Mary-Jane! If they were too salty for your tastes, I would use unsalted butter next time, or just decrease the salt called for in the recipe. Don’t change the amount of baking powder! I made this post church (read : starving). It turned out great! I doubled the recipe and cooked it in a 6 quart pot with vegetable stock and without the green onions (used onion powder). What is it about church that makes you SO HUNGRY afterward?? haha! It’s the same story around here! I’m glad you liked the recipe! 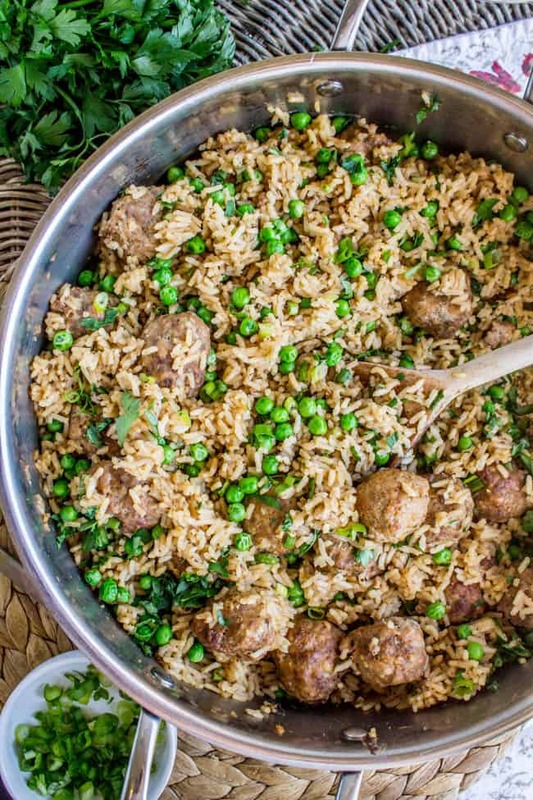 The beef meatballs with rice and peas was a huge hit at our house! I have big teenage eaters, so I doubled the recipe, we might have enough for one plate of leftovers. This was delicious! My son has declared it’s his new favorite meal. Thanks for the recipe! I loved the ease of it as well! That’s awesome Michele! You know it’s a winner when there’s hardly any left :) Thank you for leaving a comment!! We love this dinner. Getting my oldest to eat it is difficult but he’s just picky. We really like it and make it every week! It’s quick, easy and delicious! That is awesome Adrienne! It’s always so nice when you find a meal even the picky eaters like. Thanks for the comment! How did I miss this recipe when you made it? I LOVE the swap for meatballs. I need to try that next time myself. Thanks for the idea! Thanks for the recipe Mary!! It’s a classic!! Can this be made with brown rice? Would there be any necessary alterations? Hey Sara! 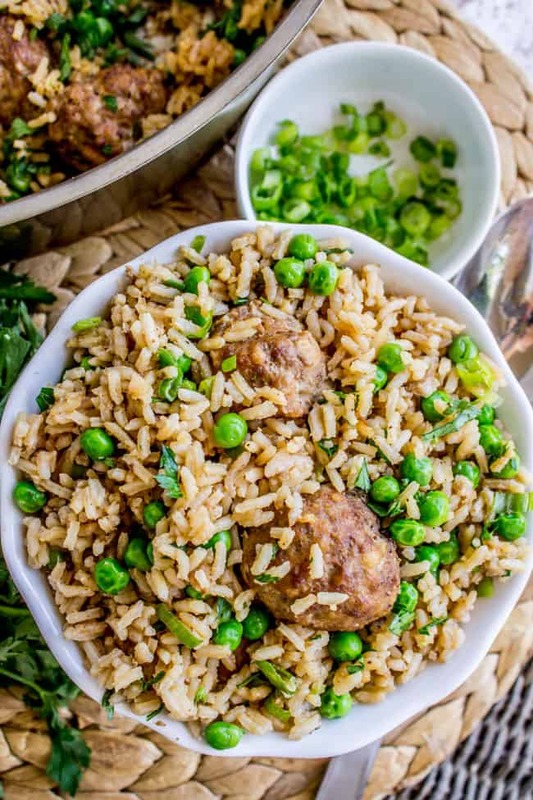 I’ve never made this with brown rice, and yes I do think there would need to be alterations but I’m not sure what they would be. I would have to do some testing. Brown rice takes much longer to cook than white rice. Let me know what you try out! Hi, do you think this could be made with minute rice? I’m not sure Michelle! I’ve actually never made minute rice. I bet you could make it work but don’t have any suggestions for you. Let me know how it goes if you try it out! Karen, Oh yes, rice is my soul food. LOL. 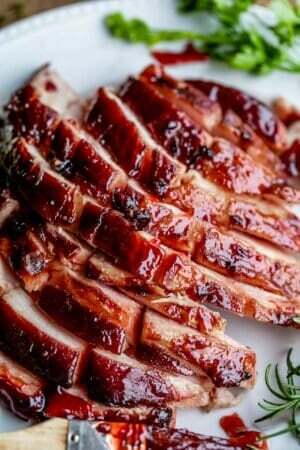 I keep several different varieties on hand so will make this recipe with long grain rice. Thanks so much! Asian, Caucasian, or Hawaiian we all love rice! 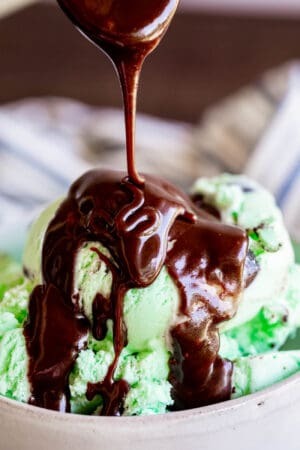 This looks and sounds so good and so easy to make! Did you use medium grain or long grain rice? I think it looks like medium in the photos but not sure. As an Asian, I totally love this. thank you! As a white person, I totally love this too! I seriously can’t tell if this is a spam comment or not, and I don’t care because it made me laugh so hard. Lol!! I feel your pain!!! I hate grocery shopping but I despise grocery shopping with my littlest ones!! Sometimes, it’s just too much!! I can’t believe you are that far along already, how exciting!! 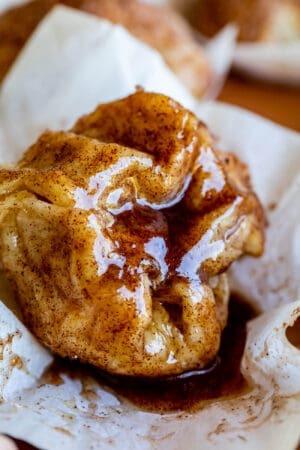 Love this recipe and that it is all made in one pot, those are my saving grace right now, lol! I remember when I had Charlotte and she was just a few days (weeks?) old, I took her on our first solo outing, just me and her to the grocery store. I walked in. She cried. I walked out and drove home. haha!! Speaking of one pot…I have to go check out your one pot bacon alfredo!!!! That sounds like a stressful trip to the grocery store! :) What a yummy, hearty meal! Ha, oh it could have been worse. When Charlotte was little she once dropped a box of cherry tomatoes and they spilled in every possible direction. haha!! That kielbasa dish was going to be the one I reviewed, but at the last minute I went with the meatloaf. I love that you subbed in meatballs >> considering I make up a batch of 80 each month and freeze them. For dishes like this! Oh MAN I need to make that meatloaf. It looks so good! Do you seriously make 80 meatballs every month!! You are amazing. Oh, my kids would love this and they are so picky. I love a quick weeknight dish! And just for the record, I avoid taking my kids to the grocery store at all costs. Hope you are feeling great! I bet they will love it Karen! Kids love rice. At least mine are obsessed. Good to know I’m not the only one who goes crazy at the grocery store! !